Downstairs in our semi private consultancy room, we offer you a confidential and relaxed wig fitting service. Our wig specialists have been advised and trained by Macmillan nurses and have taken the Trevor Sorbie M.B.E “My New Hair” diploma and are experienced in dealing with medical hair loss. We can guide and advise you on how to select your new hair including style and colour. We stock a full range of wigs in both synthetic and human hair variations as well as an extensive stock of wigs for hire. 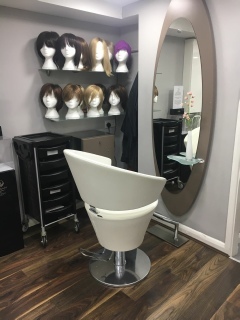 We also offer a styling, washing and cutting service for your own wig as well as a full range of headwear and aftercare products. The initial consultation is free of charge and every client will also receive one complimentary wig aftercare session. Once your hair starts to grow back, we carry a wide range of products designed specifically to both strengthen and stimulate your new hair growth.